Head of Practice: Lecturer Ya.V.Pohoralskyi. Archaeological Practice was held on July 28 – August 9, 2014, on the basis of Volyn Rescue Expedition Team of the Institute of Archaeology of the National Academy of Sciences of Ukraine (Head – Doctor of History, Professor D.N. Kozak, Deputy Head – V.H.Bayuk). 25 first-, second- and third-year students of the Faculty participated in the practice on the multilayer settlement of Khrinnyky (Shankiv Yar tract), the digging of which started in 1993. During this time several thousand square meters of archeological site’s area have been explored. More than 300 various housing and household facilities, tens of thousands of ceramics fragments, household items and labour tools from Chalcolithic period to the Kyivan Rus have seen the light of day. The results of this settlement’s exploration have been published in numerous articles and monographs. The expedition members lived at the expedition base, located on the right bank of Khrinnyky water-storage basin (Styr river), near the village of Tovpyzhyn. 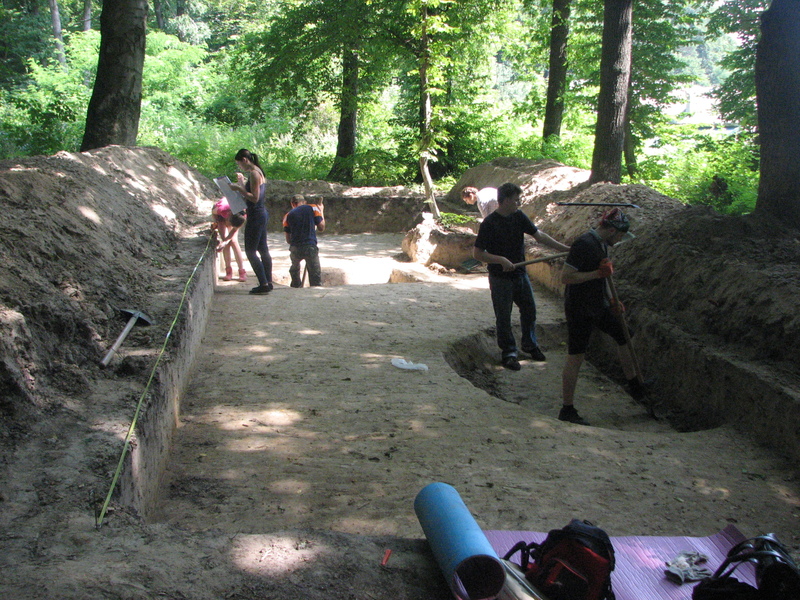 Excavation site where the LNU students worked is located in the northern part of the village (left bank of the water-storage basin). During the course of practical training the area of 144 square meters were explored. Numerous waste of silicious production (including established place of silicium processing with a large number of silicious flakes and scales), hammer-stone (grinder? ), piece of silicious spearhead dating back to the Bronze Age, fragments of ceramics of the Late Roman period (Wielbark culture). 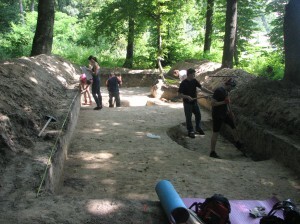 A pit (its deeper part) of Wielbark housing has been excavated. It was a part of the complex of buildings around the Gothic sanctuary discovered in 2011. The housing had an oval-shaped form and its floor was located at the top border of the firm land. The pit was filled with brown loam that visibly stood out against the background of the black humus. Many fragments of curved and molded dishwares, animal bones, pieces of clay coating have been found in the filling. The most interesting items found in the housing are spindle whorls made of clay (also decorated with geometric patterns), bone piercing tools, glass bead and a fragment of amphora handle, which is a clear evidence of local population’s contacts with Roman provinces of the Northern Black Sea and the Danube regions. 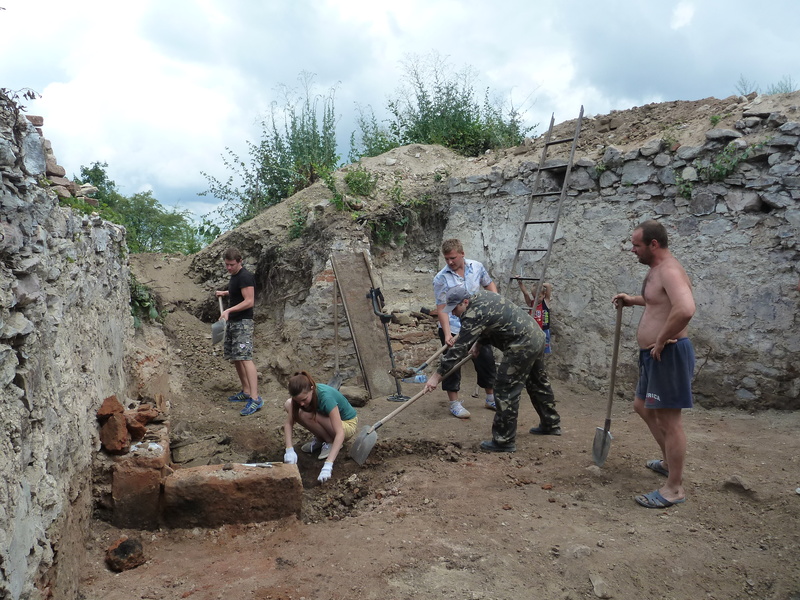 On July 7-27, 2014, the students of the IST-11 Group were undergoing archaeological practice in the town of Brody, Lviv region, being a part of Brody archaeological expedition team of the Ivan Franko National University of Lviv. Its objective consisted in mastering of the practical course of archaeological research by the students majoring in history and carrying out of excavations of Brody-I multilayer settlement. In Zastavky tract, in the south-eastern edge of Old Brody, two excavation sites with a total area of ​​94 square meters have been arranged. Remains of an open-type fireplace of the Bronze Age – Pre-Scythian Epoch, as well as two fireplaces of the Wielbark culture dating back to the late Roman period have been discovered. Fragments of dishware and labor tools of the Early Bronze Age (Horodok-Zdovbytska culture), Pre-Scythian Epoch (Vysotska culture) and Late Roman Period (Wielbark culture) have been found. The discovered bronze fibula, two glass beads and two copper decorative metal plates, dating back to the second half of the III century A.D. are especially noteworthy. Identified materials give reasons to believe that the Goths had lived on the territory of Brody region for some time in the 3d century A.D. The tribe that was the bearer of Wielbark culture migrated from the south of the Baltics to the Black Sea and the Danube in the beginning of A.D., and played significant role in the European history during II-VIII centuries. It was them who formed the first state unit on the territory of modern Ukraine, i.e. state of Hermanariha. Until recently it was believed that Wielbark heritage objects in their “pure” form can be observed only within the Western Volyn region up to the Goryn river, and a peculiar enclave in the Southern Pobizhya. However, the research carried out in Brody, as well as other sites of Volyn-Podolsk frontier (Yosypivka-III, Suhovolya-I, VII, Malynyshche-I, Dudyn-II, etc.) give reasons to assume their presence in this region as well. Along with the development of the Western Volyn territory in the last quarter of the II century A.D. the Goths also made a settlement in the frontier between Volyn and Podillya. The soils favorable to living, farming and house land cattle breeding led to establishment of long-term settlements in this region (Kobyllya, Dudyn-II, Malynyshche-I). At the turn of the III century A.D. this territory has became a launching ground for infiltration of the Germans into Cherniakhivska culture medium in Podillya region. Thus, archaeological research in Brody produced a solid scientific material which is highly important for further exploration of ancient historical past of Brody region. 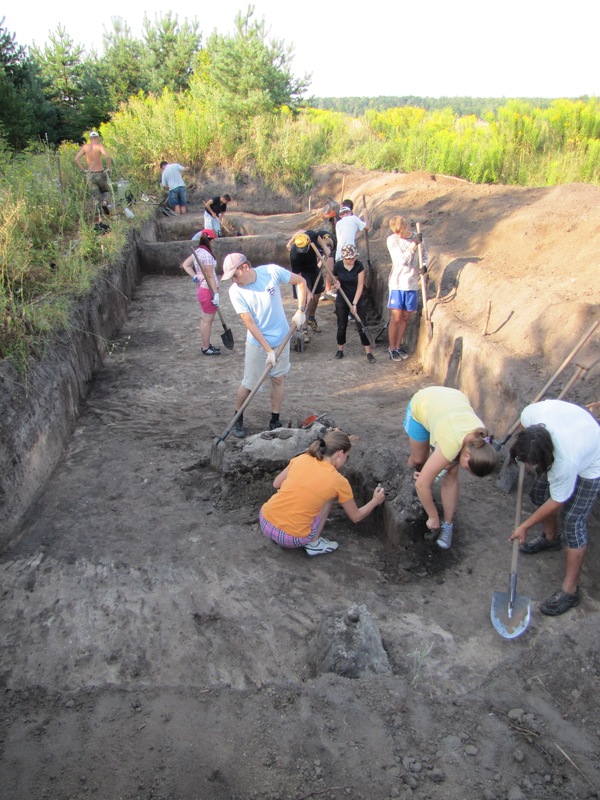 Archaeological Practice of the students of IST-14 was conducted on July 7-27, 2014, on the base of the Ukrainian Studies Institute which jointly with the Ivan Krypyakevych Local History Museum of the National Academy of Sciences of Ukraine (Expedition Head – A.Havinskyi, Researcher at the Department of Archaeology) and the Faculty of History, the Ivan Franko National University of Lviv (Head of Practice – Docent N. Bilas) organized archaeological expedition aimed at exploring the Shypshyna Mountain (Holyanivka) in the town of Vynnyky. Today, part of this archaeological site has been destroyed due to town development with the terrain being leveled down, therefore, the expedition team faced the task of carrying out rescue research. 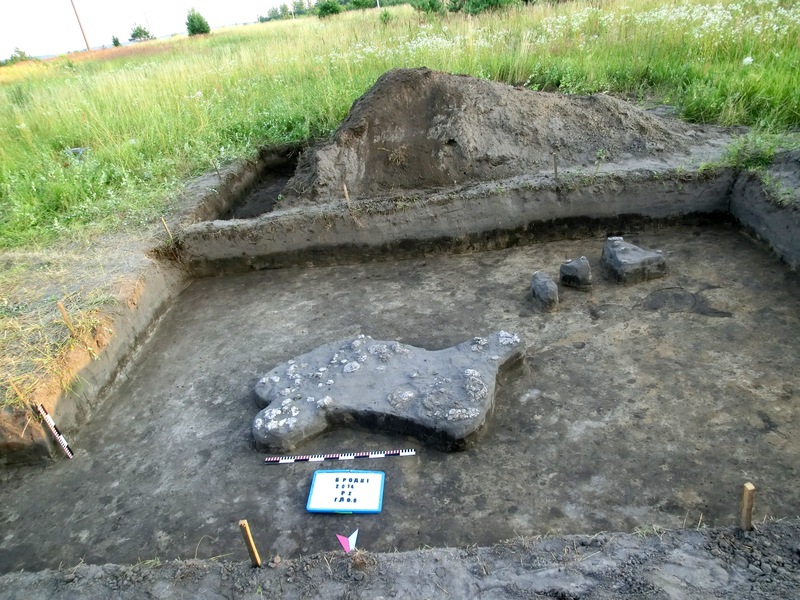 Three excavation sites with a total area of ​​124 m2 were arranged in Vynnyky-Shypshyna area in 2014. Four sites of the Early Iron Age, namely three pits and a part of deepened housing structure were established. A small number of ceramics fragments ceramics dating back to the Early Iron Age were found in the cultural layer and sites. Tulip-shaped pots and semicircular bowls were identified among them. Some dishwares are decorated with pliant edges with the so-called finger impressions and through holes under the edge of the crown. In addition, minor exploration works were carried out in the area of the nearby Zhupan Mountain, where a well-known two-layered archaeological site dating back to Chalcolithic period (funnel-shaped dishware culture and Trypillya culture) is located. In the 1980-90s it was investigated by M. Peleshchyshyn. The objective of the work consisted in establishing the settlement’s borders in the ridge-top area of the mountain, so for this purpose three pits have been arranged in different parts thereof. It has been established that there is no cultural layer. Therefore, we have reasons to believe that the ancient settlements were located only in the highest area of Zhupan Mountain. heological practice of the first-year students (group ICT-16) of the Faculty of History, the Ivan Franko National University of Lviv, in village of Yezupil, Tysmenytsia District, Ivano-Frankivsk Region. According to the plans, the Paleontological expedition under the direction of O.S. 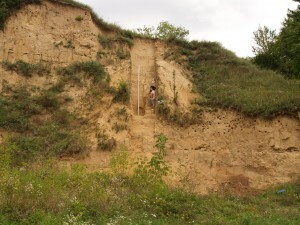 Sytnyk continued the archeological and geological research of the memorial Yezupil’ I in Tysmenytskyi District of Ivano-Frankivsk Region. The period of works on the site was August 4-24, 2014. Yezupil I (5 Paleolithic objects in the neighborhood of the village are known today) is located about 10 km to the South East from Halych, on the right bank of the Dnister River (a small cape of the second over-flood plain bench), 1-2 km from the Northern boundaries of Yezupli village (former Zhovten) of Tysmenytskyi District of Ivano-Frankivsk Region. From the Eastern side the cape-shaped territory is bordered with a shallow, but rather long ancient beam. The outskirts of the cape border directly to the wide (1.5 km) Dnister flood plain. The materials of the many-layered memorial Yezupil I are printed in some articles and monographic work (Sytnyk, 2000), but many questions are still unknown and controversial. The main problem is the culturally-chronological interpretation of the industry of middle-Pleistocene cultural layers II and III, and also specification of stratigraphical peculiarities of conditions of artifact bedding. During the research period that was being performed here since 1994, there were excavated more than 200 sq. m. of the site square, at which more than 2 000 artifacts, principally instruments, were found in Paleolithical layers. In 2014 a small site (15 sq.m.) was researched at the place of excavation I, and also some new objects were researched – Yezupil’ VI, VI-A, Yezupil’ IX and X of the total square of more than 30 sq. m to the depth of 3.5 m. On the place of excavation I there were found only the remnants of the layers of Mustier time II and III. 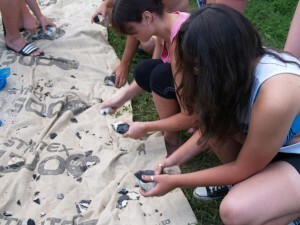 There were found more than 40 flinty wares, cores, scrapping knives, knives and little-endians. All the flints were without patina, well-preserved, but often fragmented under the influence climate and temperature changes in the ancient times. All these materials are dated about 80 thousand years ago. On the site of new points of Yezulip VI, VI-A, Yezupil IX and X there were found some flinty wares dated more than 70-60 thousand years ago (middle Paleolithic Period). Besides that during the field season of 2014 two more middle-Paleolithic sites were revealed – Mariyampil’ IV and V not far from Mariyampil, Halych district, Ivano-Frankivsk Region. The cultural horizons with the remnants of flint artifacts were found at the depth of 15.5 m (Mar. 4) and 4.5 m (Mar. 5). The stratigraphy of layers was described, analytical study was performed. The following geologists took part in the expedition: Professor Lanchont (Lublin, UMCS), Professor A. Bohutskyi, Docent R. Dmytruk and A. Yashyn, Candidate of Geography O. Tomeniuk etc. They described the layers, selected some tens of soil for different natural analyses and for dating the TL. Archeological practice of the first, second and thirds-year students in Korolevo village of Vynogradivskyi district of Transcarpathian Region in 2014. The group of the first-, second- and thirds-year students (7 people) participated in the excavation of the castle in the village of Korolevo, Vynohradiv district, Transcarpathian Region. Our group was the part of the expedition of Uzhhorod National University that has been studying the town in Mala Kopania village for many years (leader:Professor V.H. Kotyhoroshko). But, not far from this memorial there are located not less interesting and perspective for researching remains of Korolevo Castle. That is why we under the direction of Docent of the Department of Ancient World and Middle Ages, Uzhhorod National University, I.A. Prokhnenko, performed the excavation of one of this object’s rooms. The revealed findings topped the expected results. Firstly, there should be mentioned the finding of the monumental slab of the internal adornment of the room with the emblem of the Pereni family. This fact, both as the found breakup of the stove with great number of highly artistic tile, eloquently certifies about that the castle was not peripheral or secondary. Also in the filling of the room there was found a fragment with a part of inscription in Latin and other details of internal adornment. It can be spoken about the everyday living of the castle inhabitants based on numerous findings of fragments of ceramic kitchen and tableware (dated back to the 14th century), iron wares and coins (two Polish and some Hungarian). In particular, there was found a part of belt set, a bells and a Norinberg badge. 15 ball workpieces were also an interesting finding. Three stone balls fixed on the level of the room’s floor also certify about the castle’s history. The tiles also deserve special attention. The part of them despite the fact that the castle had been exploded appeared to be undamaged. The date – “1610” – was inscribed on two tiles with the unicorn pictures. Among the pictures on the tiles the vegetable ornament and the pictures of mythic animals (dragons, unicorns) prevail. These findings drew wide reaction in the society. The expedition’s work was widely highlighted in the mass media and Internet. In particular, the thing is about the following materials: New Unique Archeological Findings of Korolevo Castle “Niolab” //http://vinturist.blogspot.com/2014/07/blog-post_11.html; Archeological excavations of Niolab Castle in Korolevo //http://www.youtube.com/watch?v=VFNA3y4mIjo; Secrets of Niolab Castle in Transcarpathian region: the Archeologists Have Excavated the Tile with the Picture of a dragon /video/: http://goloskarpat.info/blog/zakarpattya/40397.html#ixzz3CjLLeZKP;http://www.khmerhn.com/watch?v=VFNA3y4mIjo; http://news.join.ua/read/39/95/75/23/;http://society.ua.news.uapartner.com/itemid_1771335.htm; Korolevo Castle Reveals its Secrets to Lviv Archeologists //http://prostir.museum/ua/post/33243; Thancarpathian Archeologists Again Make Excavations on Korolevo Castle Nialab (video) // http://zakarpattya.net.ua/Zmi/126366-Zakarpatski-arkheolohy-znovu-kopaiut-na-korolevskomu-zamku-Nialab-VIDEO. Besides the archeological excavations, I.A. Prokhnenko organized also an informative cultural and excursion program. The students visited Khust, Vynohradiv and Uzhhorod Castles, saw Dacian town in Mala Kopania, extended their knowledge about the history of Transcarpathian Region by visiting the expositions of local museums (including the archeological museum of Uzhhorod National University). Also a meeting with the Trascarpathian humoristic poet and public figure Mykhailo Chukhran was organized. 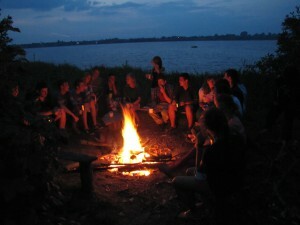 This all was supplemented with active rest in the off-working time on the river Tysa and walks to mountains. 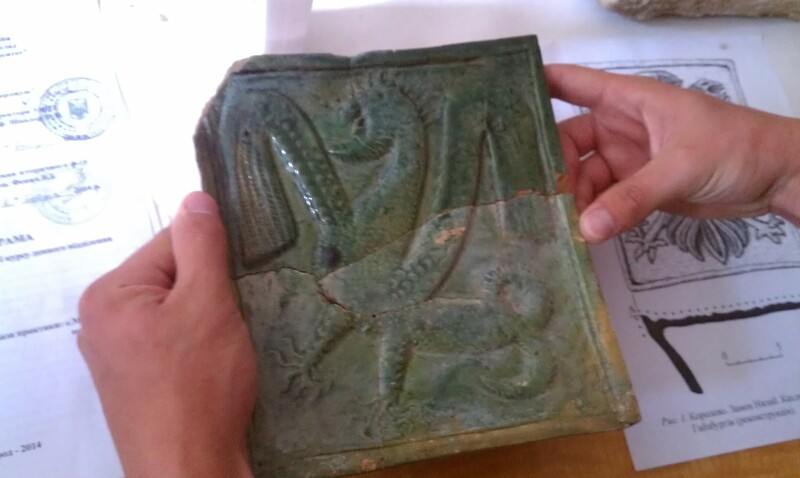 Therefore, the archeological practice in summer of 2014 passed successfully and informatively. We are grateful for the preparation of the practice to the management and lecturers of the Ivan Franko National University Lviv and Uzhhorod National University. 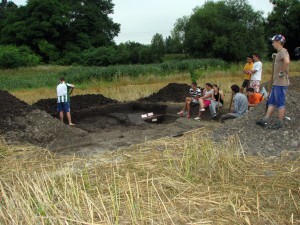 Archeological practice in the village of Kutkir, Busk District, Lviv Region, in 2014. One of the tasks of Busk archeological expedition is the general research of the Zakhidnyi Buh River. In archeological season of 2014 the research was performed on the many-layered settlement Kutkir 3 (revealed in 2012) of Kutkir village of Busk District of Lviv Region, located on the left bank of Stavchanky River (right tributary of Poltva River). On the site of this memorial on July 7-27, 2014 there was performed the archeological practice of the first and second-year students of the historical faculty (15 persons). The purpose of this research was to determine the thickness and character of the cultural layer on the site. During the practice four test pits with the total square of 60 sq. m. were placed. The cultural layer on the memorial reaches the depth of 0.5-0.6 m. the destructions of two archeological objects were revealed: the ground dwelling and administrative building of the late Roman period. The movable material is presented by the remnants of stucco and curve ceramic ware of Cherniakhivska and ancient Rus cultures, fragments of ruined clay walls and a burner. We managed to reconstruct a small stucco jar out of some pieces.